Over the weekend, mall-goers of SM MOA were in for a surprise as opposed to the usual Santa Claus clad in his usual red suit, handsome men in red and white were spotted roaming around to give free WiFi! Wu said the event was held to educate internet users of the advantages and features of the devices, and let them experience firsthand why people are now asking for a Huawei when purchasing a pocket WiFi. “Everybody wants a reliable internet connection, as the leading global ICT solutions provider, Huawei is known for building telecommunication networks around the world, as such, our strength lies in designing products that would work best with the current infrastructure of these mobile broadband networks,” says Wu. Audiences who “spotted” these Hotties and uploaded their pictures on social media also got the chance to win their own pocket WiFi devices and other exciting prizes. “Always on” mentality With the continued growth and increase in the number of mobile devices being used to access the internet, Filipinos have developed this “always on” mentality or that need to be always connected. According to a study called Wave7, Filipinos have been using social media platforms 53 hours a week—11 hours more than the total global usage. Thus it comes as no surprise that from being the text messaging capital of the world, the Philippines has now become the social media capital of the world. “Whether it’s to keep in touch with friends and family, share new experiences or meet new people, we are always looking for the best way to connect to the internet,” notes Jose Vega, Sales and Marketing Director, Huawei Device Philippines. “One of the first things people ask about as soon as they arrive at their destination– whether its a hotel, a restaurant or even at a friend’s house is for the Wi-Fi password, but since not all venues could handle the number of people connecting to their routers, internet connection can be very slow– that is if you can even connect in the first place. That is why having your own Pocket WiFi device remains the best and most convenient solution especially if you are travelling with your family or friends and need to connect several devices at a time,” he added. The Huawei Flash is an LTE enabled mobile WiFi hotspot highlighted by an exquisite metallic halo button at the center, and one touch play for easy operation. On the front of the device, there are two single LED indicators for battery and signal strength. The Flash can provide internet connection to 10 Wi-Fi enabled devices with download speeds of up to 150Mbps and upload speed of 50Mbps. The Flash is powered by a 1500mAH battery, which can last to up to 5 hours of WiFi usage and up to 300 hours in standby mode. Install the Huawei Mobile WiFi App 3.0, the Flash lets you quickly and easily “share” photos, apps between mobile phones accessed to the same Mobile WiFi. 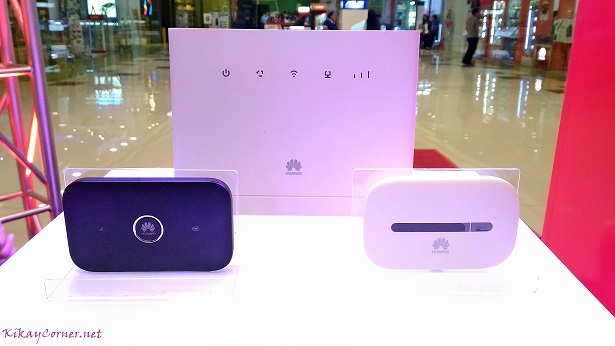 The Huawei Flash supports Cat.4 LTE 4G FDD-LTE 800/850/900/1800/2100/2600MHz, 3G UMTS/DC-HSPA+: 850/900/2100MHz, and 2G GSM/EDGE/GPRS: 850/900/1800/1900MHz frequency bands. It likewise supports dual band WiFi 2.4Ghz and 5Ghz. The Huawei Spark refines both style and size and is world’s most compact 21 Mbps 3G router. The one key design blends elegance and practicality to deliver portable network in style. True to its name, the Lightning supportsfast LTE CAT4 connections of up to 150Mbps. This WiFi router is best for SME requirements as it can deliver maximum speeds of LTE CAT4 150Mbps through its Gigabit Ethernet port. The Lightning’s enhanced Wi-Fi extends wireless coverage and eliminates dead corners and offers wireless access for up to 32 devices. The Huawei Lightning supports peak download speeds of up to 150mbps and upload speed to 50Mbps. On UMTS network with DC-HSPA+ technology, B315 could achieve downlink speed to 42.2Mbps and uplink to 5.76mbps. The Huawei Lightning is also backward compatible with GSM and EDGE.